A female bear and her two cubs were feeding on crab apples last month next to Escalante Hall at Fort Lewis College. Colorado Parks and Wildlife removed the bears for everyones safety. Stopping traffic, two small, plump brown mounds appeared from the darkness and crossed Rim Drive on the Fort Lewis College campus a few weeks ago, followed quickly by their equally robust mother. 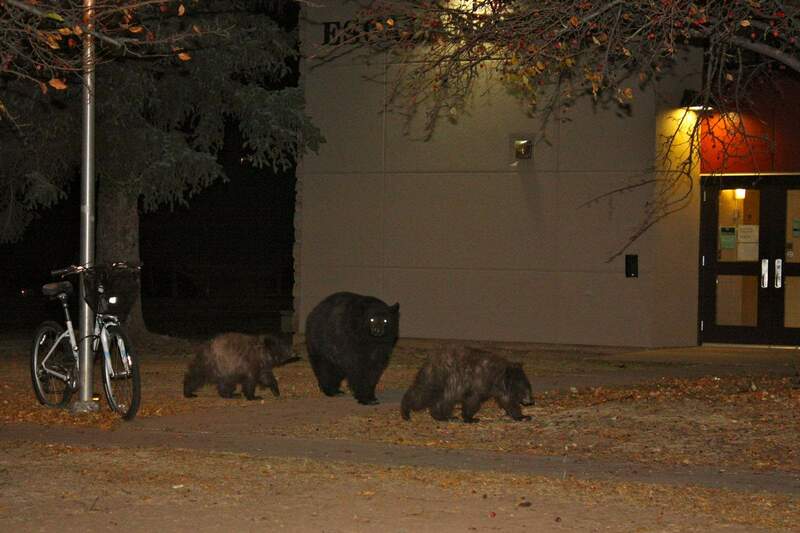 The bear family made its way up the lighted sidewalk to Berndt Hall, stopping heartbeats and changing the plans of a group of students attempting to leave the hall at the same time. The mom and cubs then made a determined beeline for one of the residence halls, settling to feast in a small grove of crab apple trees. Students came and went from the dorm in the dark, unknowingly passing under trees inhabited by a family of bears feeding on the apples, despite the sound of breaking branches and occasional grunts of warning. Understandably, representatives at the college were concerned, and I was invited to give a talk at one of the residence halls. Four of the students in attendance had experienced heart-pounding, late-night encounters with the naturally protective and jumpy mother bear. In the end, and because of obvious safety concerns, Colorado Parks and Wildlife tranquilized the mom and two cubs and they were removed from campus, their stint at higher education curtailed. Problem solved, right? Sure, one solution in dealing with bear issues is to simply remove bears we dont want around, regardless of conditions that made doing so necessary. Crab apples were the root cause of public safety concerns with having a female bear and cubs frequenting a busy college campus. The root cause remains, and conflicts will continue  perhaps with these bears, perhaps with new ones. (This is an example of why human-bear conflict keeps increasing: Three bears, instead of one previous, now know the location of food-rich environs.) And those bears can be removed as well. Or, we could address why bears are showing up in urban settings in the first place. Sometimes, moving bears goes in the win column. Recently, a small cub had been seen for days roaming near north City Market, with no mother in sight. With great effort and care, Colorado Parks and Wildlife officers were able to capture the little female cub. She was underweight at 27 pounds and likely wouldnt have survived the year. The cub was taken to a wildlife rehabilitation facility near Del Norte, where she will be fattened up to be released in the wild, given a new lease on life. In other news, noting that irresponsible residents are affecting responsible ones and that current laws arent changing residents behavior fast enough in keeping trash away from bears (there have been 829 reports of bears getting into trash in town this year), Durango City Council will soon be asked to beef up the city wildlife ordinance. Recommendations to be considered include: trash containers needing to be stored away, or bear-resistant, other than the morning of collection; and increasing the fine for violations from $50 to $200, putting it more in line with the majority of other community wildlife ordinances in Colorado. Bp@frontier.net. Bryan Peterson is director of Bear Smart Durango, formed in 2003 to educate residents about safely and respectfully coexisting with bears and to advocate for policy changes. For more information, visit www.bearsmartdurango.org.